Hello all, looking for thoughts on running a 20to30 ton log splitter off the aux. hyd ports for my front end loader? I have a BX2230 with a LA211 front loader. Will it have heat problems, both with the 23 hp diesel motor and the hyd system. I split about 5-6 coards of wood per year and can't justify a $1400 log splitter. Will running my tractor at 1/3 to 1/2 speed for an hour have bad side affects? Or should I get a 25 ton splitter with a 8hp gas motor and let my little tractor rest? I'm new to this site so be kind, ! Jeff, long as your tractor hyd. system has adequate pressure to operate the splitter I can't se why it would strain the system any more thn running the loader for an hour. The spec's on the splitter should tell you how much pressure is required. Flow rate of your system really don't matter that much, a low flow rate just means it will take a little longer to push the ram out to it's full stroke, it's all about pressure. I know that since electronic ignition came along it was the salvation of the single cylinder engines, they start now days. I still have such a bitter taste in my mouth from fighting those things that I don't even want to see one that does start. Far as engine speed, the higher the RPM's the higher your hyd. flow rate should be, I'm kind of comparing to my 4310/48 hoe, about 2/3 throttle seems about right Frank. 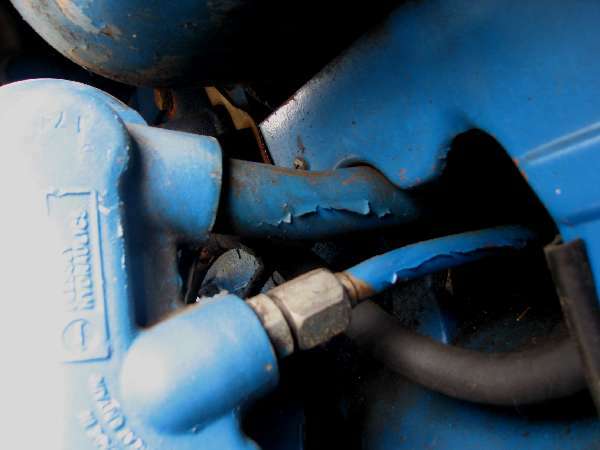 Check the fluid capcity of your tractor. A fully extended 4"x24" cylinder requires about 300 cu in of fluid, and only about 1/4 of that is replaced from the rod side of the cylinder, for a net of about 3/4 of a gallon to run the splitter. May not be a problem, but it's worth checking into before you buy a splitter. I run a 3-1/2"x18" splitter cylinder off my 7810 to reduce the fluid requirement. It only needs less than 1/2 gallon net fluid to run. I haven't run into anything yet it won't split. If I ran Quick dissconects on both lines going to the splitter cyl. would that not make the lines and the cyl. act as its own "storage tank" for hyd. oil? And all I would have to do is fill it after the first fiew times I stroke the cyl. and get the air out? And maybe a little every so often for loss at the QDs and around ram seal. Am I in the ballpark ?!? To an extent. That's why I refer to the "net" oil required to stroke out the cylinder. Because the rod occupies volume on the retract side of the cylinder, and the cross sectional area is a function of the square of the radius, it takes considerably more fluid to fill the stroke side than the retract side of the cylinder. The larger the diameter of the rod, the larger the net fluid required is. The "net" fluid required is the difference between the volumes on the two sides of the cylinder, stroked out /and retracted. This fluid comes from the circuit reservoir, being the tractor in this case. Once the lines are charged with fluid, you can replace the fluid that stays in the lines and not have a draw from the reservoir. The cylinder will always draw because of the difference in the volumes between stoked and rettracted.